Bury Tomorrow have become a force to reckon with over the last few years since the release of second album The Union Of Crowns, a record that placed them well and truly at the front of the British metalcore scene, leading to a number of highly successful tours and putting the band on everyone’s radar. It’s also a tough record to follow up, but the five-piece hold nothing back on their third full-length Runes, which is set for release May 26th and will likely spawn a similar level of success. Metalcore isn’t a genre known for frequently releasing ground-breaking albums, and in a way Runes is as typical as the genre comes. It’s a juggernaut of a record from start to finish; an adrenaline fuelled behemoth which rarely lets up, and although it may not see any new ground broken in terms of its label it does mark a progression for the English five piece, who’ve upped their game on their third full-length. 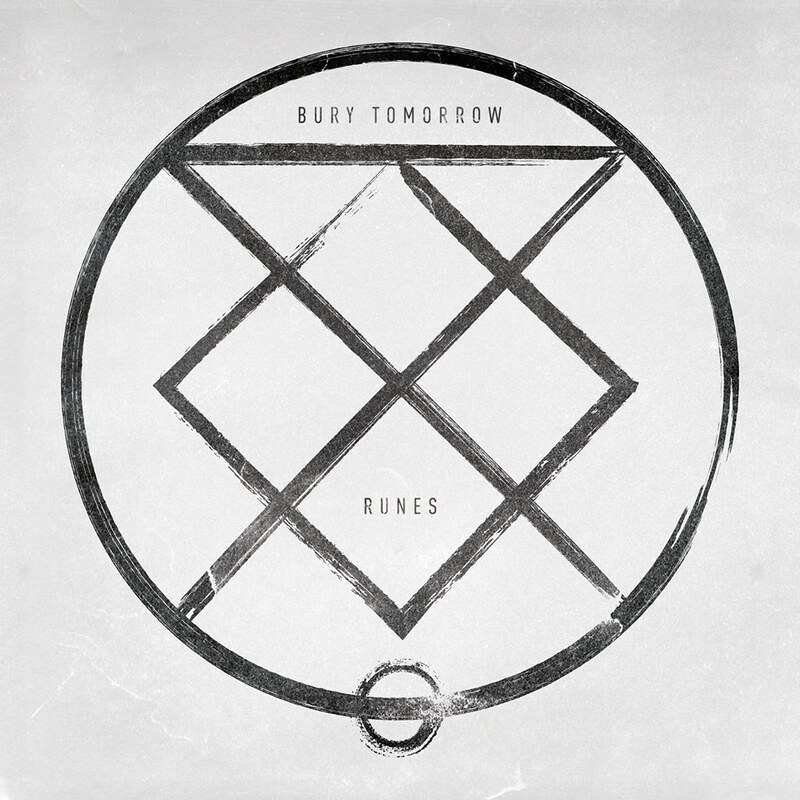 Runes is a faster, heavier record that shows Bury Tomorrow push their own sound onto bigger and better things. Take Our Gift, which is absolutely furious, beginning with a breakdown of sorts and featuring some of Dani Winter-Bates’ best vocals to date, with clean vocalist Jason Cameron sounding powerful in a completely different way. The two contrasting vocalists are excellent throughout, with Winter-Bates sounding savage and Cameron sounding sublime, with both giving exactly the performance you’d expect from two of the genres best. The addition of new lead guitarist Kristan Dawson also benefits Runes massively as his technical style shines through, bringing something more to the band’s music. The solo towards the end of the previously released Watcher is staggering, whilst his climbing guitars sit brilliantly alongside choruses which aspire to reach even higher, particularly on huge second track Shadow, A Creator which was my favourite from the record. Runes takes a big influence from the ancient runic language (hence the title) and it’s an interesting concept that gives more depth to a record which takes inspiration from an unusual source and doesn’t suffer because of it. I don’t know a whole lot about runes, but after a quick Google search the links between songs and their respective symbols became fairly clear, with the link often apparent – Year of the Harvest =‘jera / harvest’, Last of the Ice = ‘isa / ice’ and so on. The mannaz (man) rune relates to mankind finding a higher self, and this ties in perfectly with lead single Man On Fire which features a huge chorus including the lines ‘Free me said the man on fire, release me to the higher / Finding sanity I know, will leave me breathless. There’s a clear and commendable amount of thought gone into Runes which will likely be underappreciated, and it perhaps gives a listener an incentive to read deeper into the lyrical content of the record, which is often overlooked on heavier releases. At times it is easy to forget about the meaning behind Runes when tracks are as bristling as Garden Of Thorns and Darker Water, both of which are vicious and accomplished, writhing before another mammoth chorus, and when Winter-Bates’ screams ‘I am the demon unleashed’ on the latter you’d be hard pressed to disagree. Runes is an incredibly well written record, chugging forwards whilst often giving way to gratuitous amounts of melody, making for a release which blends the two styles well despite a few shaky transitions between them. Bury Tomorrow undoubtedly play to their strengths for the entirety of Runes, but this formula also contributes to Runes’ biggest weakness. Bury Tomorrow are insanely good at what they do, but they do it again and again and again. Eleventh track Divine Breath is the only real space for a breather on Runes, showcasing Cameron’s delicate delivery over a suitably low key backdrop, and it’s a shame it doesn’t last longer. Bar this track you’ll have likely heard everything Runes has to offer by the end of sixth track Darker Water, because for all its good intentions this is a repetitive record, with similar song structures used constantly – bitter, venomous unclean verses give way to towering clean choruses with technical guitars sitting alongside, with the odd breakdown thrown in for good measure. For me, it’s what holds the genre back time after time, because as good as a metalcore album can be it’s usually slightly tiresome. I was making notes whilst listening to Runes and after the halfway point was struggling to say new things about new songs. Granted, if you like the music Bury Tomorrow play (which they do play exceptionally well) it won’t be as big an issue, but the repetitive nature did mar my experience of the record. The bonus version of Runes does bring a bit more variety with two fairly impeccable acoustic stripped back renditions as well as the excellent Hail The Lost, which is better than the majority of the standard version tracks, and I’d definitely recommend this edition of Runes. At the end of the day Runes is a brilliant metalcore record, and it should further cement Bury Tomorrow’s position as one of the genres best and brightest. The record’s only major flaw is its repeated formula, but this aside Runes is exactly how the genre should sound. It’s angry and charged, yet also melodic and technical, and it’s a step up from The Union Of Crowns that sees the band cover already trampled ground but do so in emphatic fashion.